Recently, through my anthropology study combining an interest in environmentalism, nature based spirituality and activism, I’ve learnt a lot about ways of connecting to the land, and the way that many people feel a spiritual or sacred connection to a particular place. Many Pagans (as well as lots of other people with different or unnamed beliefs) have been involved in anti-roads protests or trying to stop something like a Tesco’s being built on ancient woodlands that contain many sacred sites like ancient burial grounds and stone circles. This often involved living in trees or spending a great deal of time on the land, leading to deeper and more connected feelings with nature and the organic environment. I was fortunate enough recently to go to a Rainbow Family gathering in Kent, on a sacred site containing an ancient (really ancient – from the neolithic times about 3500BC!) burial ground and sacred stones, known as the coldrum stones. This site is also significant as it is on a Ley (sometimes called Ley lines) and you can see a line of churches sacred sites that map out this line of power. Anyway more about the Rainbow family later (although if you are in the UK looking for a gathering you can try facebook, or take a look at the UK site http://www.rainbowcircle.co.uk/rainbowcircle.html ) but for now just wanted to show you an interesting article I found about healing and magical places round the world. See if you have been to any, and which ones you’d like to visit next (so far I’ve only been to table mountain but was too lazy to climb it!) 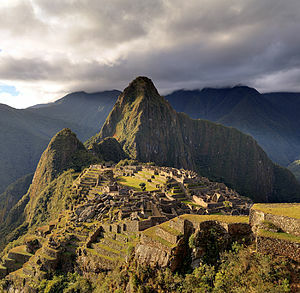 but would love to go to more, especially Machu Picchu since my dad is from Peru! Next Next post: Free Dragon Fable RPG – cute!